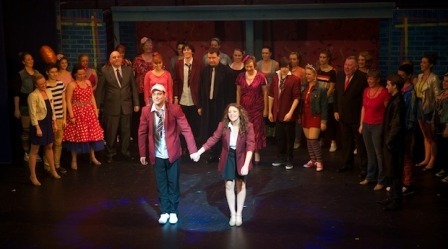 Harrogate Theatre last night (25th Oct) saw the opening night of Our House, a production by the St Andrew players. Set to the music of the band Madness it tells the story of a young boy who commits a small crime to impress his girlfriend. A two-way plot line follows the youth’s two possible fates depending on whether he escapes or confronts the judgment of the law. The show features twenty Madness hits, from One Step Beyond and House of Fun to My Girl and Baggy Trousers which makes it a hit for fans of the 1980s ska band but it also has much wider appeal. Running a two-way plot line makes the production much more complicated than a traditional plot-line but making it undeniably worthwhile the extra effort it takes to watch. The production was presented with both strong lead actors and support. The dance routines being especially crisp with the energy that the music needed from them. 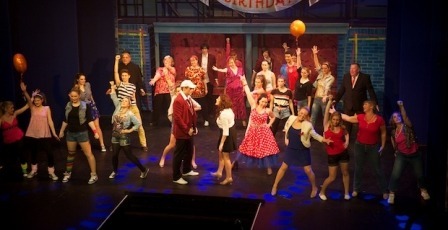 The show makes for great entertainment being a great good production which can be recommended.